Imagine the Michelin Man over weight and on steroids. Then give him a droll, dry sense of humor. What you end up with is Baymax, an inflatable robot whose goodwill comes to terms in this 54th animated feature film from Walt Disney Animated Studios. Being the first animated super hero film featuring Marvel characters this proves to be an excellent collaboration. Also on board is Director Don Hall for 2009s Princes and the Frog and Director Chris Williams for 2008s Bolt. 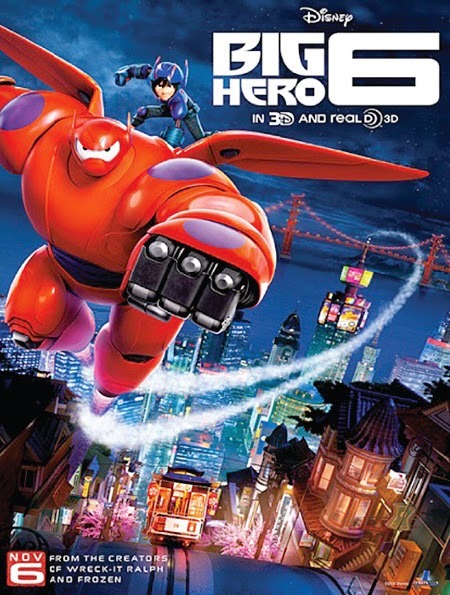 It begins in the futuristic city of San Fransokyo where Hiro Hamada (Ryan Potter), a 14-year-old robotics genius, spends his time participating in back-alley robot fights. His older brother, Tadashi (Daniel Henney), expresses concern that Hiro is wasting his potential. Following his subsequent introduction to the robotics lab at his university Hiro is inspired to gain admittance into the school. So he presents his most recent project—micro bots, swarms of tiny robots that can link together in any arrangement imaginable. Professor Callaghan/Yokai (James Cromwell), the head of the program, is impressed, and Hiro gets in. It is here where Hiro meets a menagerie of characters that offer substance to the eventual plot line. Wasabi is neurotic and convincingly done by Damon Wyans Jr. who may be familiar if you saw him as Thunder in 2010s Marmaduke. Then there is GoGo Tomago (Jamie Chung) and Honey Lemon (Genesis Rodriguez). As their knick names imply there is more to them than meets the eye. Last but not least is Fred (T.J. Miller) as the seeming ordinary laid back comic book fan. Oh and for those real comic book geeks out there the infamous and now 92-year-old Stan Lee provides a cameo voice as Fred’s father. When a fire breaks out at the university and one thing leads to another, Hiro accidentally activates Baymax (Scot Adsit). Among other voice credits Scot is also known for an acting role as David in this year’s St. Vincent. The pairing of writing skills of Jordan Roberts and Daniel Gerson allow his comedic lines to resonate with sincerity and are accentuated by the hilarious awkwardness of his girth; a true bull in a china shop. Yet, he is instrumental in bringing and holding together The Hero 6. I see a sequel to this in the future. Maybe that is just wishful thinking.